"John Muir is a fine Scotchman... but for all that it is too foolish to say that the imperative needs of a city to a full and pure water supply should be thwarted, for the sake of a few trees, or for scenery, no matter how beautiful it might be." "I hope you will not take my friend, Muir, seriously, for he is a man entirely without social sense. With him it is me and God and the rock where God put it, and that is the end of the story. I know him well, and as far as this proposition is concerned, he is mistaken." Money and artificially inflated human need would prevail. Congress and President Wilson signed the valley over to San Francisco, and nearly 10 years later Hetch Hetchy was under 300 feet of water. A photo of the Hetch Hetchy Valley near Yosemite, taken circa 1900, before the construction of a dam that submerged the scenic valley. Photo from Wikipedia. 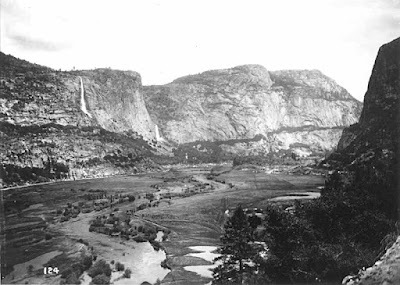 As one proponent of the damming of Hetch Hetchy argued, the purpose of conservation was to "take every part of the land and put it to that use in which it will best serve the most people." We have certainly made strides in conservation since 1913, but arguments made against Muir then are being thrown at citizens once again. This time Washington and Wall Street are selling a destructive snake oil to cure a real and urgent illness--climate change brought about by greenhouse gas emissions. Americans are being asked to sacrifice nature for the "highest purpose" and benefiting the most people. 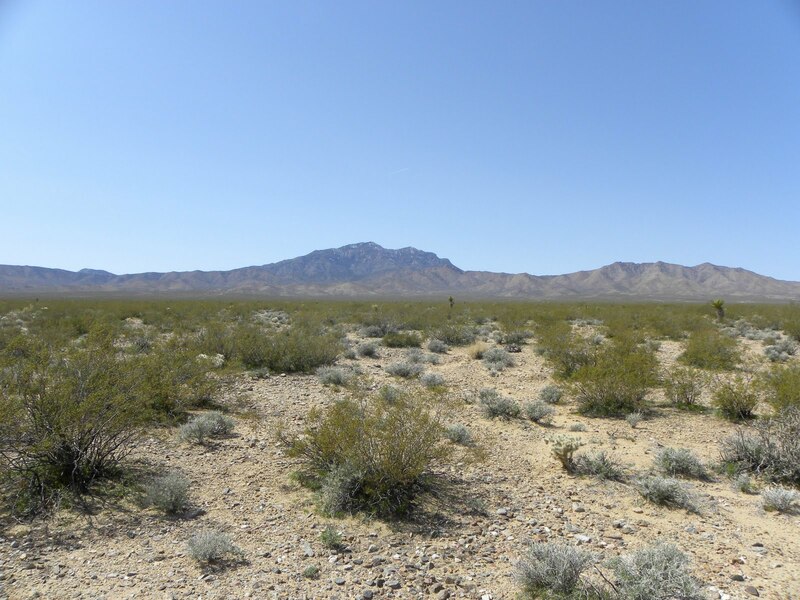 The Department of Interior--seeking to accommodate solar energy companies backed by Google, Morgan Stanley, Chevron, and Goldman Sachs--plans to sacrifice hundreds of square miles of mostly pristine American deserts for massive solar facilities. Washington approved dozens of square miles of large solar projects throughout Nevada and California last year alone. 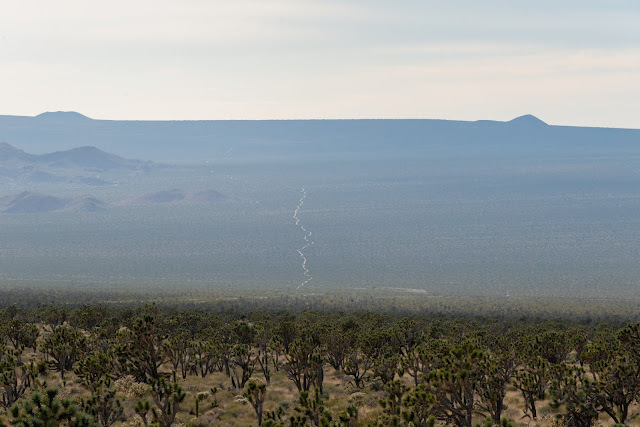 Two of the approved projects will rip apart the ecological balance of the Ivanpah Valley--a serene and graceful landscape carved out of the northeastern Mojave Desert. BrightSource Energy and First Solar have already begun construction on the two projects in this nearly pristine desert valley, mirroring the competition between green and greed that raged over Hetch Hetchy almost a century ago. In 2008, Zweibel co-authored an article in the Scientific American that supported paving over much of America's southwest with solar panels. Mr. Zweibel failed to mention that this would only meet a fraction of America's renewable energy needs and probably push several species to extinction. A commenter on another press article titled "Are New Solar Power Projects Anti-Environmental" in Miller-McCune complained that "local interests" lost sight of the climate change threat, and should not be allowed to stand in the way of big solar. The commenter used the name "czichella", believed to be Carl Zichella of the Natural Resources Defense Council. 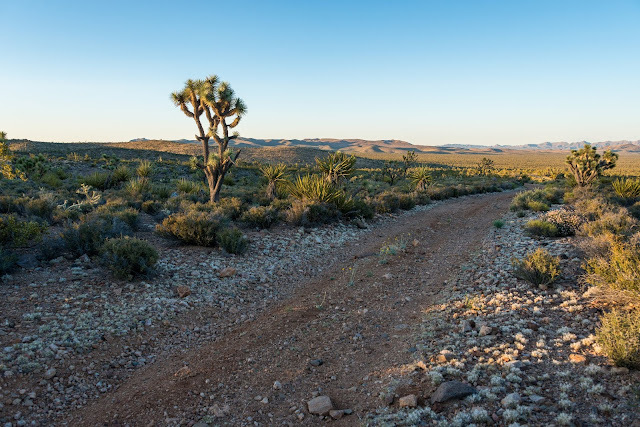 "Unfortunately many people with very local interests are overstating the impacts of these developments, which, while large, constitute a tiny area of the desert." 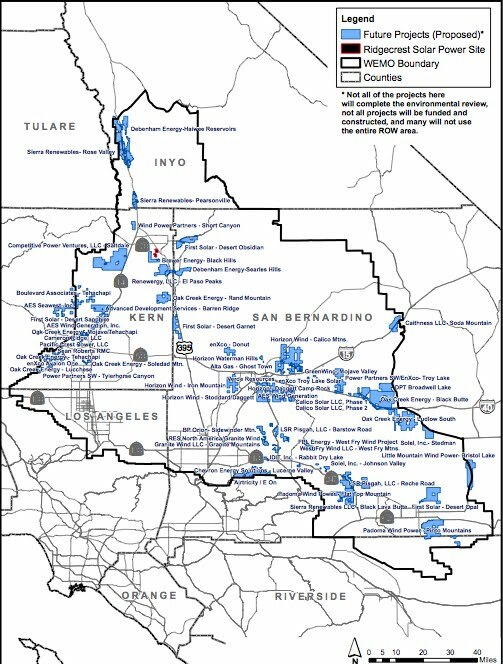 The blue blobs on the map below represent proposed solar energy projects in just a portion of Southern California's desert. Some of the projects would be the size of the cities they power. I guess Mr. Zichella found a different definition for "tiny." Other so-called leaders of national environmental organizations have argued that the loss of beautiful landscapes and scenic vistas that put America's natural heritage on display should not be used as an excuse to stop massive renewable energy projects. Atlantic Monthly editor Alexis Madrigal--who is promoting his new book idolizing BrightSource Energy--called for a new type of environmentalism that focused on human use instead of preserving nature in a pristine state. On Earth Day, he published a piece calling the conservation of land "boring." His idea of environmentalism? 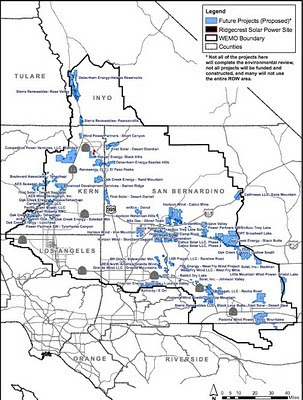 Industrializing public wildlands and putting them in the hands of wealthy corporations. And if you do not agree, you should be ashamed of yourself, because you are not thinking of the greater good. 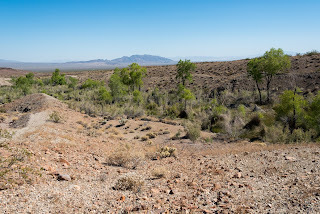 A portion of the Ivanpah Valley, much of which is set to be bulldozed for giant solar projects. 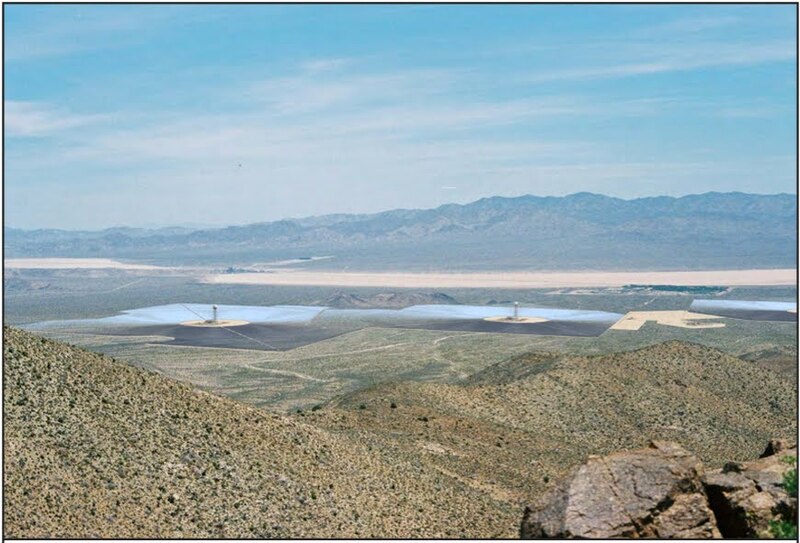 BrightSource Energy's Ivanpah Solar Energy Generating System alone is expected to displace or kill 140 endangered desert tortoises, and threaten already rare desert wildflowers and bighorn sheep foraging habitat. These are only a few of the narrow-minded and greedy arguments that bear frightening similarities to comments made by Muir's opponents in 1913. Muir would undoubtedly be an advocate for renewable energy, but his passion for Mother Nature's cathedrals would have prompted him to seek a wiser solution. He would not have had to look far. Local solutions are being supported by local-minded citizens and naturalists. The type of concerned citizens derided by Zichella, Madrigal, Zweibel, Carnegie, and Kent. Washington and Wall Street lobbyists may see dollar signs painted on public lands, but concerned citizens all see an answer to climate change closer to home. Rooftop solar (also known as distributed generation) can generate renewable energy more efficiently than large facilities in the middle of the desert, which require costly transmission lines and taxpayer subsidies, not to mention higher electricity rates. 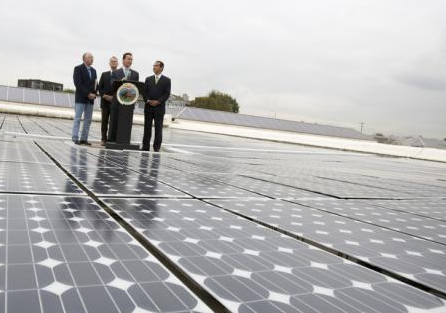 Former California Governor Arnold Schwarzenegger ironically stands amidst rooftop solar panels near downtown Los Angeles as he announces plans to bulldoze California's public lands for Big Solar. A better solution was literally right under his nose. California has already installed 836 MW of rooftop solar. This is no small accomplishment considering the lack of policy support for distributed generation. Feed-in-tariffs, like the structure called for by concerned citizens in Nevada, would encourage homeowners, apartment building managers, and small businesses to install more rooftop solar panels by crediting them for excess energy generated by their panels. Tax incentives for citizens that install solar panels are in place, but could be strengthened. The Department of Energy plans to provide over $2 billion in taxpayer-backed financing for a single destructive and risky solar facility in the middle of the desert. Why not put that money back in the pockets of homeowners and businesses with rooftop solar, instead? Property Assessed Clean Energy (PACE) is another way to encourage rooftop solar--allowing homeowners to finance solar installations through their property tax bills over time. Rooftop solar often increases property values, and will cut electricity bills. These are the solutions Muir would be pointing to in defense of his cathedrals. Hopefully this time Washington will listen to the local voices before we lose more of our wild lands to unnecessary destruction. 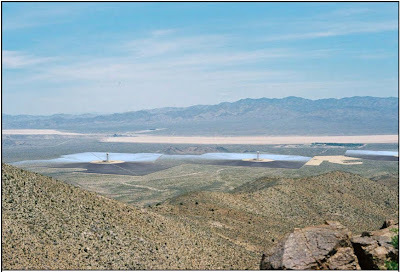 A computer rendering of the Ivanpah Valley with just BrightSource Energy's project. Imagine two more massive solar facilities in this same view, destroying nearly 22 square miles of the majestic desert floor. 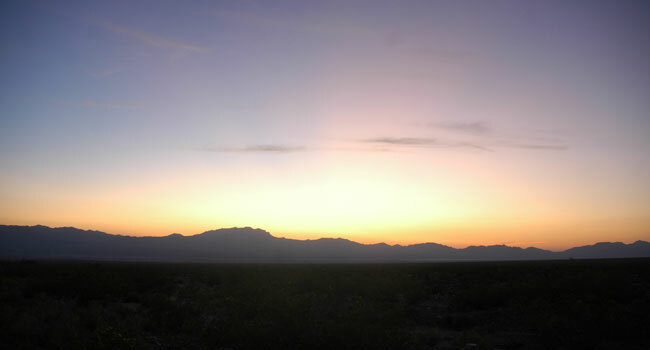 First Solar is planning to start construction soon on its Silver State project, and is proposing the Stateline project. Sunset over Ivanpah Valley, with the Clark Mountains in the background. Photo by Basin and Range Watch.